Implementing an effective shipping strategy is one of the most crucial steps each ecommerce business should follow to grow and scale. More than 90% of consumers claim that shipping options have an impact on their experience with the store. A poor experience caused by an unreliable shipping partner may lead to lost sales opportunities and turn the back of regular customers on your store. Packaging has a strong impact on the overall shopping experience, too. More and more e-businesses focus on beautiful order packaging to impress buyers and so get a competitive advantage. In this article, we’re going to give some useful tips on how to establish effective packaging and shipping processes in a Magento-driven store. To deliver a good shopping experience and eliminate customer dissatisfaction, make sure that your shipping policy is clear to buyers. Customers have to understand your shipping terms when making the purchase. So It’s a bright idea to display them during the checkout. Luckily, Magento 2 has such functionality by default. To activate it, log in to the Admin panel and navigate to Stores > Configuration > Shipping Settings. 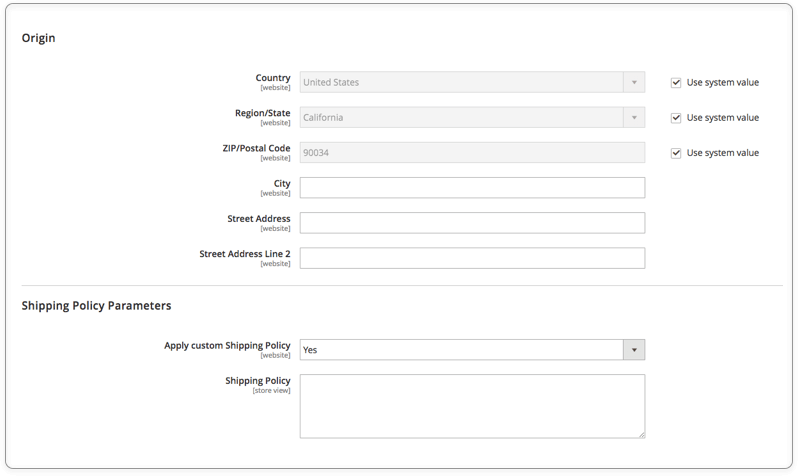 In the ‘Shipping Policy Parameters’ section, set the ‘Apply custom Shipping Policy’ to ‘Yes’ and add the text of your policy to the next field. Save the configuration to show this text to customers at checkout. Many online businesses start out with free shipping to attract new buyers and so growtheir customer base. To make the strategy work for your store, you should enable free of charge shipping in the Magento settings first. Check out our tutorial to learn how to set up it properly. Forward-thinking retailers understand that free shipping shouldn’t be the only available method to keep shipping costs from eating away their profit margin. This method allows introducing a pre-defined fixed charge to be applied to either the item or the whole order. 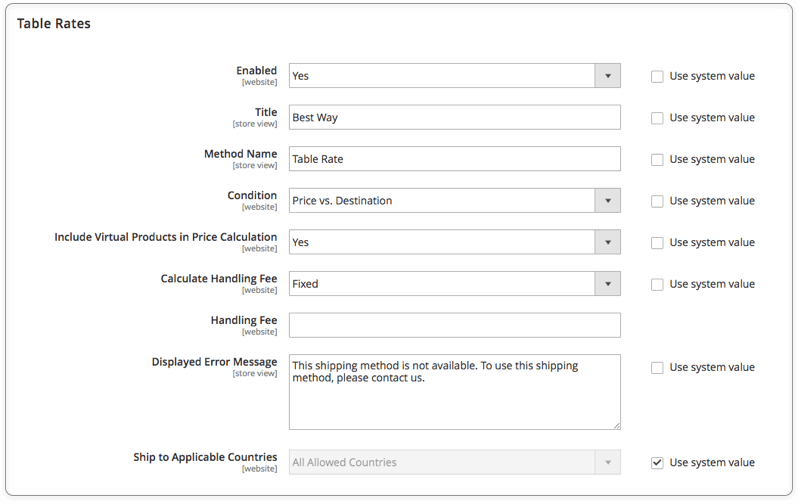 Table rates are a good option for the shipping strategy where shipping costs depend on different conditions like order weight and delivery destination. As shipment rates of many carriers are today based on dimensional weight (aka volumetric weight), you may introduce this method to your web store. The shipment method configuration is not the only great shipment-related functionality that Magento 2 has. This platform allows store owners to offer a selection of shipping carriers to their customers. All the rates are automatically downloaded, once the carrier settings are up and running. So you don’t need to go to the carrier’s website to check the rates. 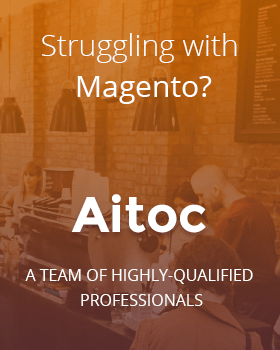 Magento-driven store located in the US, the UK, and Australia may leverage Magento Shipping, a highly flexible solution for handling multi-carrier shipping and managing customer shipments. If you have Magento Shipping in place, you may enhance packaging management with almost no effort by adding available packaging to your store’s Admin Panel. To edit existing packaging options and add new profiles, go to Stores > Shipping > Packaging. You may set packaging types, such as a box, carton, crate, cylinder, etc. You may also specify tare weight, inner and outer dimensions, and set the maximum and minimum weight allowed in the selected packaging. You may upgrade your Magento installation with a custom module to get Magento shipping and packaging under your full control. The Magento 2 Dimensional Shipping extension can help you automate and optimize these processes and this way considerably reduce your shipping costs. Orders are often packed into too large boxes, which causes higher shipping rates. Using boxes of the right size you’ll cut your shipping expenses by times. With the help of the extension, you may create different packaging box profiles in the store’s admin panel by setting different parameters: length, width, height, etc. Custom dimensional units are enabled, too. 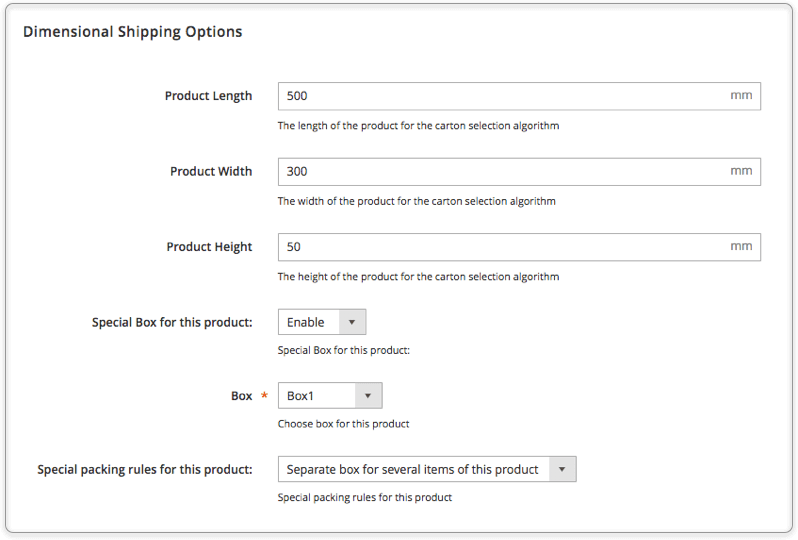 You may apply boxes to your products either automatically or manually by assigning boxes to the items. Special packing rules are one more great feature: you may specify whether to put each item in a separate box. This way you improve packaging and shipping processes at your store. Shipping is an essential aspect of any commerce business. Though shipment-related issues each business has to address are unique, there are some options that may lighten the burden. 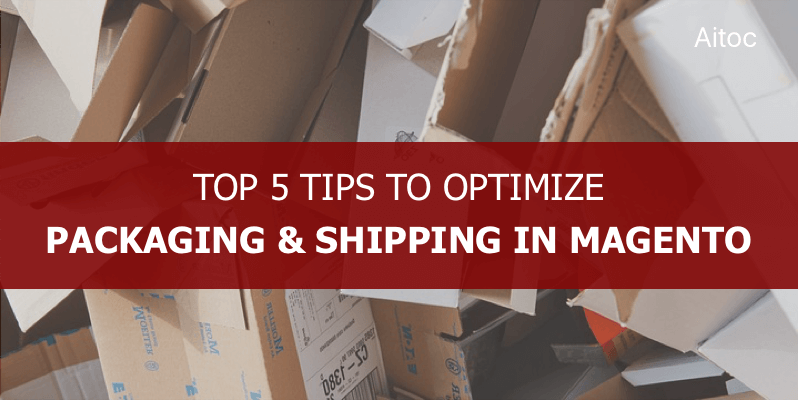 We hope that this article will help you adjust your Magento shipping strategy, so that it better serves your business needs.